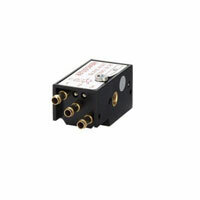 The proximity switch does not require contact and is triggered by a magnetic field or an Fe object. The device does not require a continuous air supply. A further advantage of the proximity switch is its compact dimensions. Main features: Contactless switching, Compact dimensions, Responds to magnetic field and Fe, Continuous air supply not required.